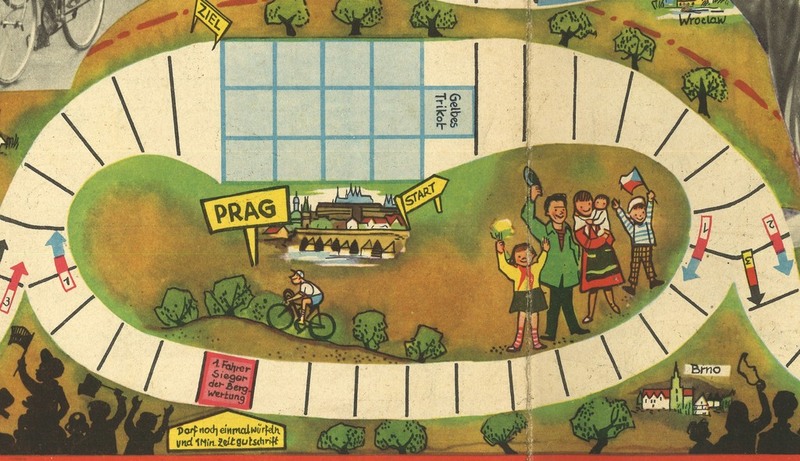 Here is another Friedensfahrt game. 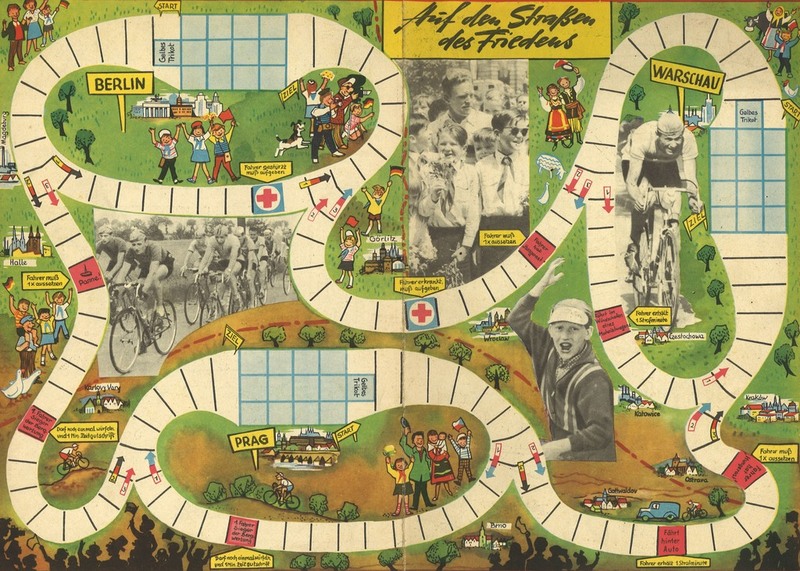 This one is called 'Auf den Straßen des Friedens' (on the streets of peace) and was included with issue 4/1959 of the monthly children's magazine "Fröhlich sein und singen". 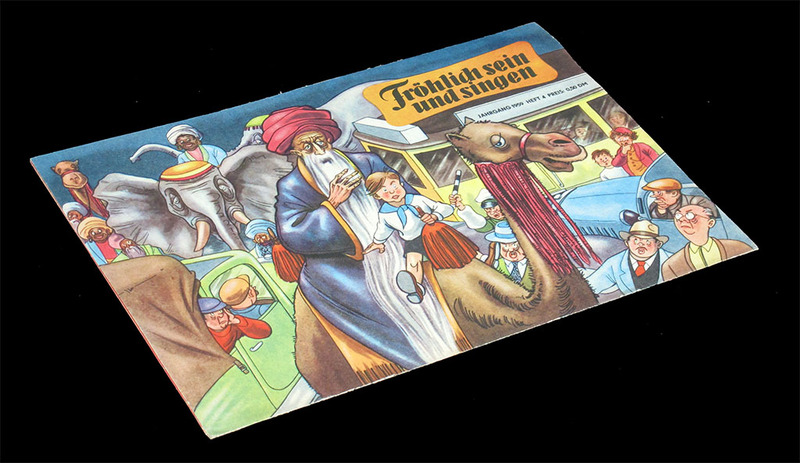 This magazine was renamed to "FRÖSI" in 1965, and that is the name by which it is remebered. 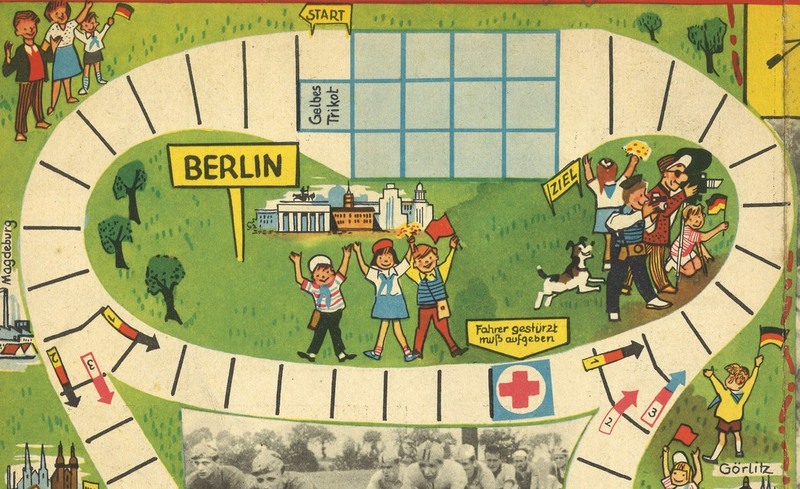 It was published by 'Junge Welt', and it was the magazine for members of the pioneer organization Ernst Thälmann and its maximum circulation was of 600,000. 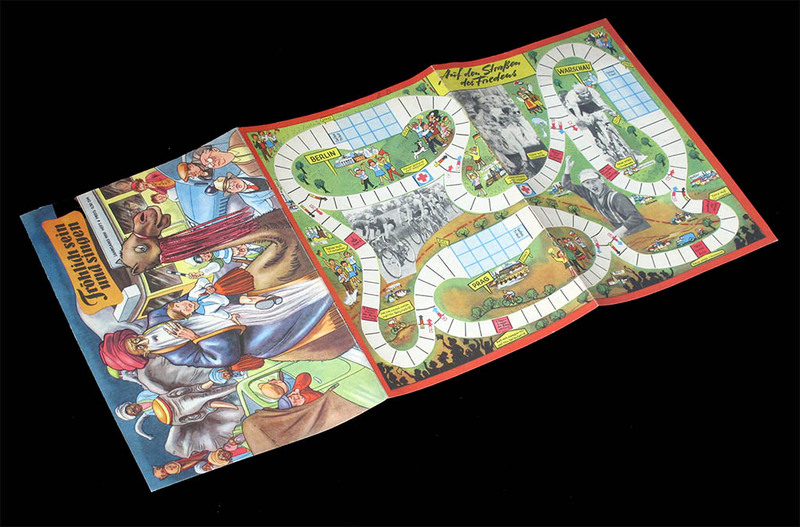 The magazine had 32 to 40 pages, and the cover was a triple sheet of light cardboard, featuiring a double-page game. Breaking again my rule of not buying incomplete magazines, I have found that unfortunately the rules of this game were not printed on the back of the cover (as are on some other FRÖSI games. So all I can do is guess, or wait for someone who has the rules and is kind enough to send them. 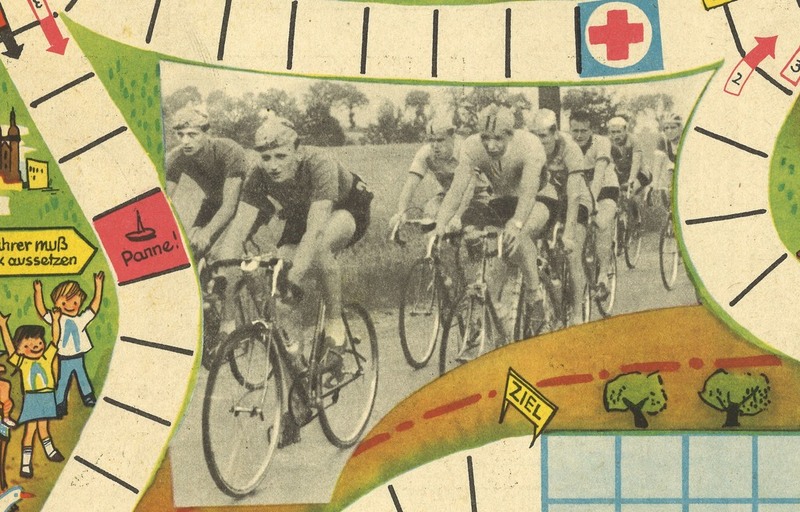 My guess is that being an Eastern-block game, players have a team of several riders (probably four, looking at the board) and it is more important to win the team competition than the yellow jersey (individual classment), but there is porobably a minor prize for the first rider to reach the finishing line. 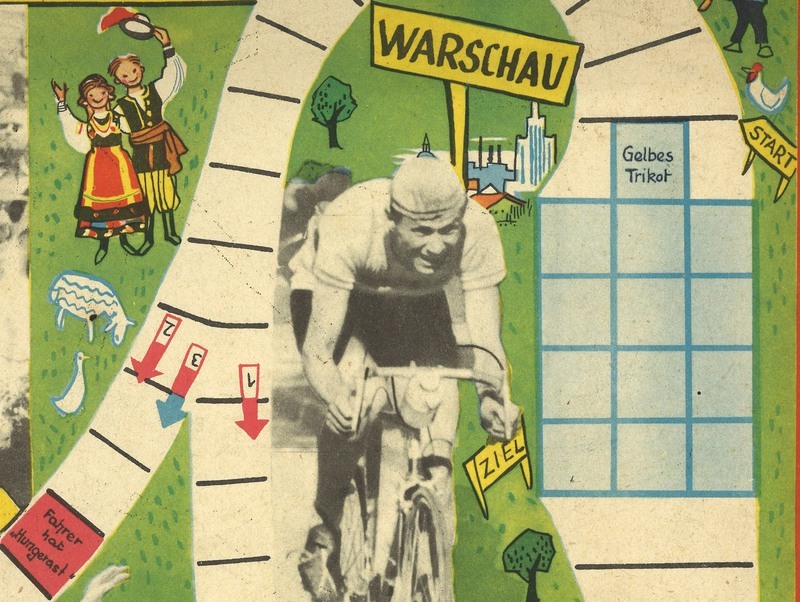 Speaking of the finishing line, 1959 Friedensfahrt ran from Berlin to Warsaw, but this is not obvious by looking at the board. 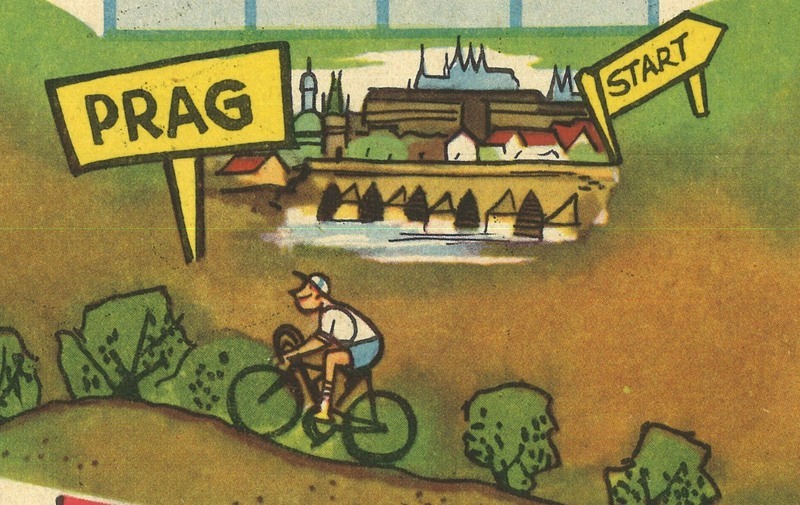 The track is a closed circuit, and It looks like there are three starting points, each of which placed in a loop arount the three cities (the third is Prague, of course). Penalty for being paced by a car. An then we find these mysterious arrows, in the colours of the German, Polish and Czechoslovakian flags. Flags numbered 1 to 3 appear at every intersection, but the colours of the flags are not easy to interpret. I observe that each country has flags numbered with a "1" around their main town, then with a "2" to the next destination and with a "3" to the other. 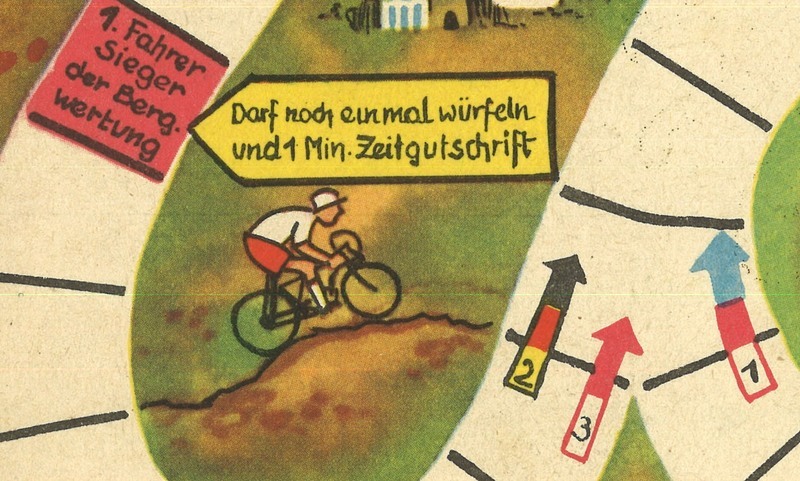 This could mean that german riders first race around berlin, then to Prag and finally to Warsaw, while the Czechoslovakian race around Prague, then to Wassaw and then to Berlin, and the Poles do Warsaw-Berlin-Prag. But that is all I can say. In each town there is a 13 field grid, which is what makes me guess that the game is played by three players, each of which manages a team of four riders each. It is just a guess, but I am willing to bet on it! Then there is this weird mix of photographs and drawings, but it is not too bad after all. Unfortunately the rules are not printed on the back. Thanks to Gordon for the information about this game.